Air India Recruitment & Results Latest List 2019 - Check or Download Now! IndiaJoining.Com – Govt Jobs, Sarkari Results and Much More! 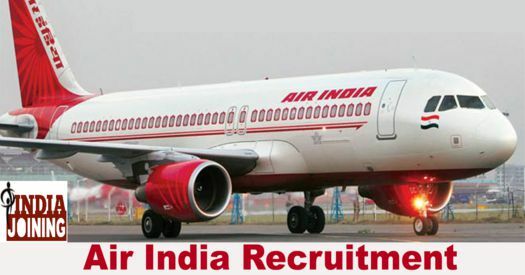 Air India Recruitment & Results Latest List 2019 – Check or Download Now! Air India is the flag carrier airline of India. The airline was founded by J.R.D Tata as Tata Airlines in 1932. After second World War, it became a public limited company and was renamed as Air India. The logo of the new airline is a red colored flying swan with the ‘Konark Chakra’ in orange, placed inside it. The flying swan has been morphed from Air India’s characteristic logo, ‘The Centaur’, whereas the ‘Konark Chakra’ is reminiscent of Indian’s logo”. Qualification: 10+2 class pass with Physics & Maths. Qualification: 10+2 standard pass with Physics & Maths. Technical Qualification: Valid ATPL & 500 hours of flying experience. Application Fee: Demand Draft for an amount of Rs.1,000/- payable to Airline Allied Services Limited, payable at New Delhi. Fee is Not applicable in the case of Ex-Pats/ST/SC candidates. Closing Date: Last date of application submission is 13 November 2018. How to Apply: Candidates may submit their applications by using the prescribed application format only. Paper applications along with photostat copies of relevant documents should be send by post to- Alliance Air (A Wholly owned subsidiary of Air India Limited), Personnel Department, Old Lufthansa Hangar Building, Adjacent to Office of ED(NR), Air India Ltd, Terminal – 1, IGI Airport, New Delhi – 110037. Download detailed recruitment advt, forms and other annexures to apply. Walk-in-interview for Aircraft Technicians for B737-800 aircrafts at AIESL TRV MRO. Airline Allied Services Limited issues the final results for selection on the posts of Co-Pilots (P2) CPL with Rating on ATR family (ATR 42-320). The Personal Interview was held on 16.06.2017. Now the Names of successful candidates along with their Examination Roll Numbers are released by AASL. Air India have released the results of Simulator Proficiency Assessment Check held on 27-10-2016 for the post of Sr. Trainee pilot (with a-320 endorsement) held at Central Training Establishment, Hyderabad. A total of 11 members qualified in the test. Air India have released the results of Simulator Proficiency Assessment Check held on 26-10-2016 for the post of Sr. Trainee pilot (with a-320 endorsement) held at Central Training Establishment, Hyderabad. A total of 13 members qualified in the test. Air India Limited have released the written exam results for the SPAC held on 22-10-2016 for the post of Senior Trainee Pilot. A total of twelve members qualified in the test. Air India Limited has announced Results of Simulator Proficiency Assessment Check (SPAC) for the posts of Senior Trainee Pilot. Simulator Proficiency Assessment Check (SPAC) was held on 17 & 18-10-2016. Airline Allied Services Limited has announced Technical Knowledge Test List for the post of Co-Pilot (P2). Interview will be held on 22-10-2016. Air India Limited have released the Interview results for the Post of Chief of Marketing held on 05th October, 2016. As the result of Interview, Mr. Jagneesh Singh Bakhshi has been found suitable for the post of Chief of Marketing, Alliance Air. Airline Allied Services Limited (A Wholly Owned Subsidiary of Air India Limited) has advertised the List of Candidates who have been provisionally eligible or eligible for the for the Group Discussion (GD). Appeared candidate may now check or download their result by clicking on the appropriate link above. Airline Allied Services Limited (A Wholly Owned Subsidiary of Air India Limited) has advertised the List of Candidates who have cleared the GD on 01 Aug 2016 and required to appear for the interview. Candidates who had appeared for this GD round may now check or download their results by clicking on the appropriate link above. Airline Allied Services Limited (A Wholly Owned Subsidiary of Air India Limited) has issued List of Candidates Called Provisionally for Psychometric Test for the Post of Co-Pilot (P2) (Rated / NonRated) to be held on Sunday, 11 September, 2016. Candidates who are undergoing the selection process, may now check or download their result by clicking on the appropriate link above. pls suggested when result out handy man and customer agent vaccancy -229 kolkata 2017.pls reply asap.. …….. Please refer Screening Test, for the post of Ramp Services Agent – I on 27th December 2016 at Jaipur. I am Ex Sub Ram Chandra Fagodia has appear the above said test and waiting for result since 27 Dec 2016. On 18 Aug 2017 i got a mail from Mr GS Khalsa on my mail ID Cancellation of your candidature for the post of Ramp Service Agent-1 at Jaipur due to your are not willing to join US by telephone call on 11 Jul 2017. actual no body has contacted to me on telephone earlier.I am fully willing to join the above said service.please let me know what i can do for joining. Please contact to the officials concern regarding this. Sir aiesl Kolkata utility hands ka result kab aayega..? Sir. When will they publish result for jr.executive mmd..